Killarney Provincial Park Interior Backcountry Camping information. A can and bottle ban is in effect for all interior adventurers, including day users. All food, garbage and other scented items (i.e. toothpaste) must be hung in a pack from a tree, or a rope between two trees, at least 13 feet off the ground and 4 feet from the nearest tree trunk. This will help to minimize surprise visitors! All drinking water must be purified via a rolling boil, purifying crystals, or a water filter. Please keep all sites clean and litter free, even if it’s not your garbage; pack it out! Try to pack out more than you pack in. Please use stoves for cooking as much as possible, if you must build a fire, use a designated fire pit and collect wood along your paddling route or well away from the campsite to avoid depletion. Ensure that fire is out before moving on. Go jump in the lake…but not with your soap! If you need to wash; lather up with a biodegradable soap at least 60 meters from the water and use a pot to rinse off. Excessive noise is not allowed at any time, solitude is part of the magic of Killarney! Avoid damaging vegetation by staying on the trails. Please do not disturb or harass wildlife. Canada's Group of Seven were among the first artists to fall in love with Killarney. A. Y. Jackson and other members of the Group lobbied the Ontario government to protect Killarney and save some of those “big old pine trees”. Killarney’s inland lakes, white quartzite ridges and much of the nearby Georgian Bay shoreline are now parkland and will remain untouched forever. The canoe is perhaps the finest vehicle to explore this accessible wilderness. Often called the “crown jewel” of Ontario’s Park system, Killarney offers all levels of paddlers numerous canoe routes coupled with magnificent scenery. Choose your route wisely and embark on a trip that meets your skills. Plan beforehand how to deal with emergencies such as equipment failure, lost food or an injury. Leave a copy of your itinerary with a contact person or leave one with us. Carry a first aid kit with you at all times and be familiar with the contents. Become proficient using a map and compass before your bow hits the water. Always carry extra rations, clothes, the proper safety gear and knowledge to use it. Please enjoy Killarney and respect the wilderness that lies herein. After your trip, visit the village of Killarney for comfy lodging, shopping, scenic cruises on Georgian Bay, or perhaps a delicious homemade meal. 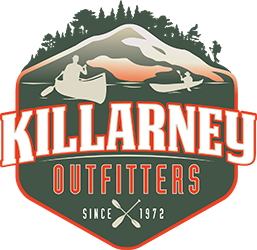 If you have any questions about your canoe trip in Killarney feel free to contact us.